Scott Roeder listens to a witness during the first day of testimony at his murder trial. (CNN) -- The trial of a man who confessed to killing a Kansas doctor who performed late-term abortions began Friday, with the prosecution telling jurors they will hear from witnesses to the shooting. Jurors also learned they will hear the 911 calls made moments later. Roeder's murder trial began in Wichita, Kansas, on the 37th anniversary of Roe v. Wade, the Supreme Court decision that legalized abortion. Sedgwick County District Attorney Nola Foulston told jurors that among the trial evidence are blood-shattered shoes, shell casings and a calendar belonging to the defendant that had the day of the shooting circled. "All those things combined will be the state's case to show this jury without reasonable doubt that this defendant, Scott Roeder, should be convicted of all charges," Foulston said. 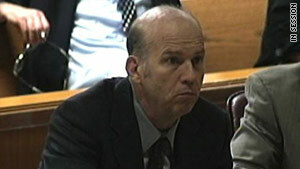 Throughout the opening argument, Roeder listened without emotion. Roeder, 51, has said he justifiably killed Tiller while trying to save unborn children. The doctor was shot in the foyer of his church in Wichita on May 31. Roeder's defense did not present an opening statement Friday morning. Foulston walked the jury through the crime, saying that Tiller was to be an usher for a Pentecost Sunday service. "Unexpectedly, a sound was heard, described by many as like a popping of a balloon," the prosecutor said. Drawing on what she said was a witness's account, she said, "A man [was] standing next to George Tiller, with his arms still raised. .... Dr. Tiller fell to the floor." After the opening argument, the jury heard the 911 call made shortly after the shooting. "Dr. Tiller, Dr. George Tiller, was just shot!" a woman told a 911 operator. With Roeder's beliefs expected to be the focal point of his defense, the trial could become the next forum in the fierce national debate over abortion rights. In several media interviews after his arrest, Roeder expressed no remorse over shooting Tiller, saying it prevented the doctor from carrying out abortions at the Women's Health Care Services clinic in Wichita. Prosecutors have called the defense argument flawed. "Case law is clear, both in Kansas and nationwide, that the circumstances of this murder do not justify an imperfect self-defense instruction," they wrote in court papers. "The state urges this court to exclude any irrelevant evidence of abortion, the defendant's views on abortion and the character of Dr. Tiller," they said. Tiller was among the most enduring targets of the anti-abortion movement, withstanding several legal challenges and many death threats, including one in 1993 in which he was shot in both arms. His killing sent shock waves through both factions in the abortion debate, with most from the anti-abortion movement condemning Roeder's actions. Roeder faces life in prison if he is convicted of first-degree murder. He also is charged with two counts of aggravated assault for allegedly pointing his gun at two other ushers as he fled the church. CNN's Emanuella Grinberg and Lena Jakobsson contributed to this report.